Most New England chowder recipes call for clams and clam juice. This is not readily available everywhere around the world. The recipe below is my own adaptation of a clam chowder recipe from a restaurant in Marblehead/Massachusetts, courtesy Josh Bevins. I use frozen fish and seafood that is readily available. And no: flour, cornstarch and other thickeners do not belong in a chowder! Makes 3 liters (3+ US quarts) of chowder = 6 main course servings with almost 200 grams (7 oz.) of seafood per serving. 150 grams (5-6 oz or 1/3 lb) sliced smoked pork belly (F: poitrine fumée pur porc). Yes, this seems a lot, but it reduces quite a bit in volume - trust me! I use 0.5 liter of water and fumet de poisson in powdered form, and overdose the powder by 50% compared to the instructions on the label. Make sure to get good quality powder: check the list of ingredients on the package for high fish content - at least 20% - and no glutamate; I found Knorr brand to be OK.
450 grams (1 lb) peeled and diced (2-3 cm; 1") potatoes. Use potatoes that stay firm when boiled - typically red or white potatoes. In France, I use the small, waxy "amandine" or "parmentine" variety with a very thin skin. 600 grams of fish. Again, I use a bag of large frozen pieces from "Picard"
Do not use the "light" variety! 50 ml (1/4 cup) of Cognac - no need to use your XO on this, VSOP and even VS will do fine (but by all means, go ahead and drink the XO). Yes, go ahead and use Armagnac instead of Cognac. If the fish & seafood is frozen, remove from freezer about an hour before starting to make the recipe. Cut most of the fat off the pork. Do not throw away! The pork may have a "skin" due to the smoking process. Cut it off and discard. 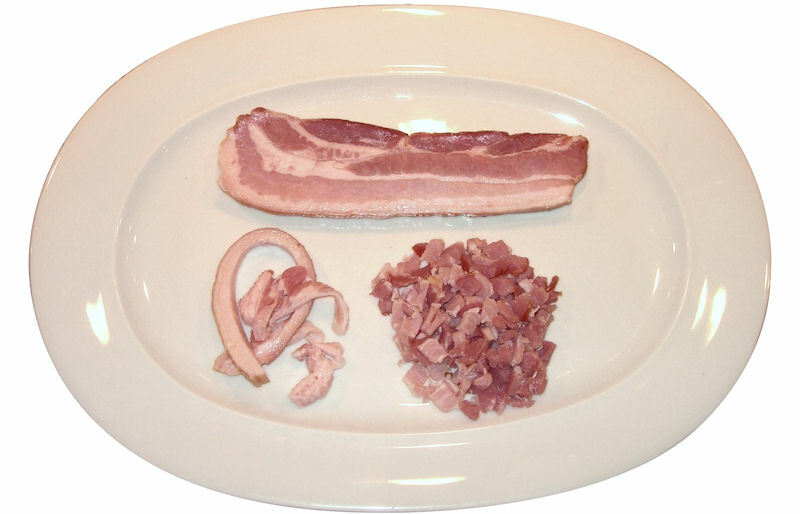 Cut the cleaned pork into small pieces - keep separate from the pieces of fat. In the pot, brown the pork meat pieces in the pork fat on low heat. 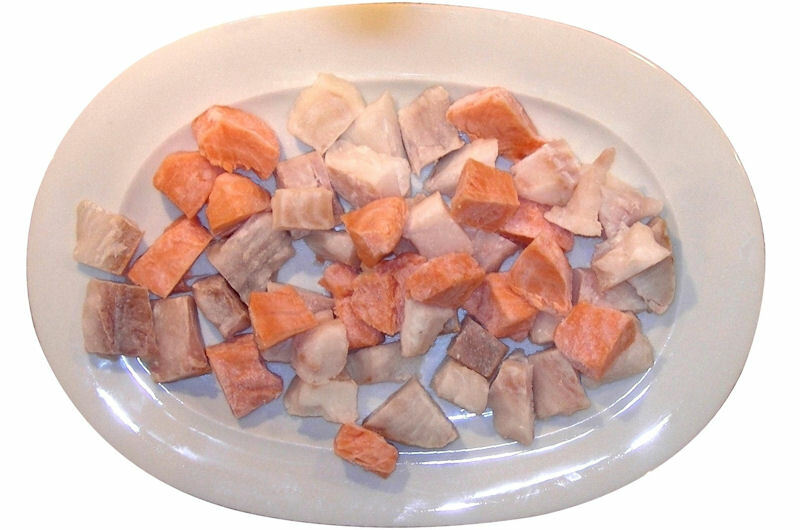 I keep the meat pieces and fat pieces separate in the pot- see photo below. This makes it easier to only remove the fat pieces later. Move the pieces around regularly with a wooden spatula, and push down on them to squeeze some of the fat out. When most of the fat has rendered, remove the fatty pieces from the pot - do not remove the liquid fat! Leave the brown parts that stick to the bottom of the pan - they will be de-glazed with the onions! Remove the fatty pieces and discard. On low-medium heat, sauté the onions in the pork fat until soft, cooked, and translucent - do not fry! Add the fish stock, evaporated milk, cream, salt, pepper, browned pork bits, and cognac to the pot. At this point, the frozen fish and seafood is not yet fully thawed out; that is OK! 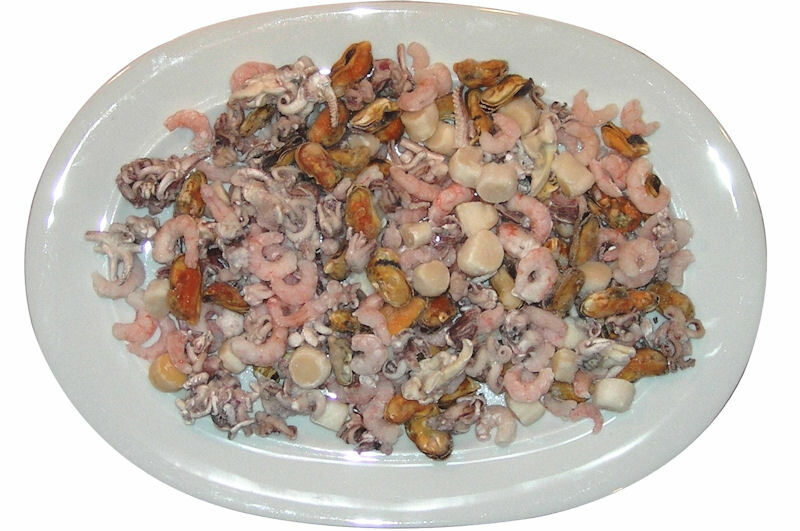 Cut the fish and seafood up into 2-3 cm (1-1¼ inch) thick pieces or slices. Add to the pot. At less than medium heat, slowly heat up while very carefully stirring occasionally (careful: do not break up the fish! ), until the the soup is almost too hot to stick your finger in - this takes 20-30 minutes! Do not bring to a boil - the cream will turn and the fish will fall apart! Turn off the heat, add the potatoes, and cover the pot. 20-30 minutes before serving, heat up while stirring occasionally. Again: do not bring to a boil! Don't you dare serve "my" chowder with fish crackers!